I remember back in the day, i.e. five years ago, the five product face used to be a super popular topic in the blogging world. Especially now that I'm working a full time job, I can now truly appreciate the ease of having a go-to five product face for those mornings where you don't have a lot of time or simply can't be asked to do your makeup for the day. As I've mentioned before, I'm also in a phase now where I'm far less experimental with my day-to-day look, and I tend to stick to a core group of products that I know will work without even having to think about it. I also think that it looks super chic and cool when you have super minimal makeup, but spend more of an effort on your outfit. The most important thing about a five product face, for me, is using multipurpose products. For example, I don't have to wear eyeshadow, but if you feel like you do using your bronzer as an eyeshadow is a good way to go. For me, the most important things that I focus on when I'm doing super minimal makeup are covering up my dark circles under my eyes and any redness on my face, defining my brows, and making my eyelashes darker. Luckily I've been blessed with good skin, so I normally don't have a lot to cover in terms of blemishes. I normally use the Glossier Stretch Concealer, when I'm doing super minimal makeup because it can be used both under eyes and every where else to even out redness. The texture is also really great for being used on its own because it never looks dry or cakey and blends in easily just with fingers. I then use the Glossier Boy Brow in my brows just to give them more color and texture. In terms of eyes I really love just curling my eyelashes using loads of mascara on simple makeup days because it makes such a huge difference with very little input. My favorite mascara is always the Fairydrops Platinum Mascara. I also like to add some color back into my cheeks because my skin tone verges on Caspar the Friendly Ghost territory most days. The Hourglass Ambient Lighting Blush in Dim Infusion is perfect for a five product face because it has enough of a glow to double as a very subtle highlight. The color also makes you look so incredibly healthy and awake (which is a department I often need help in). And last but not least is the Dior Addict Color Reviver Balm for lips. I normally don't wear lipstick on a daily basis, so especially for a simple makeup day I don't feel the need to wear lip products. 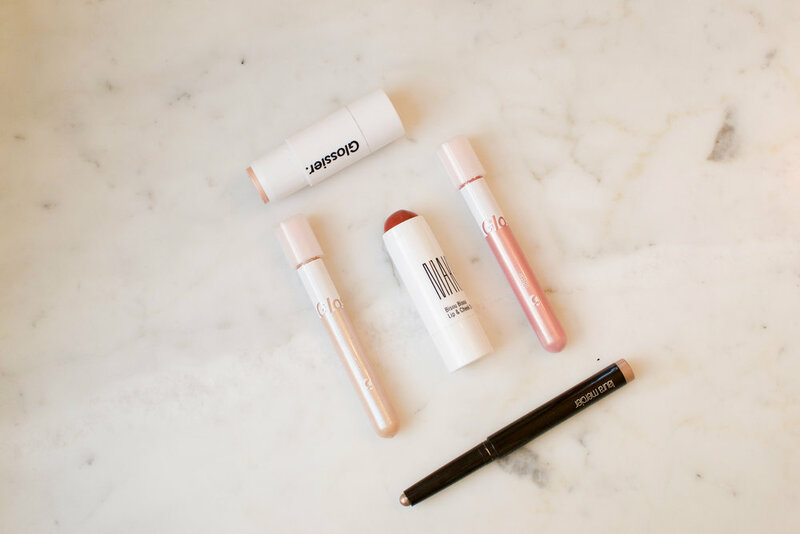 However, the Dior lip balm is perfect because it helps to hydrate the lips, while adding a healthy pink color that is super flattering on any skin tone. Even though it has officially been spring for about four weeks, it really hasn't felt like it till now. I'm someone who always feels very effected by the weather and by the changing of the seasons. I don't consider myself the biggest fan of warm weather, but coming into this spring especially, I've been much more restless for the longer, sunnier days ahead. I've also been stuck in a rut over the past couple of months because I got caught in a routine of wearing the same things clothing and makeup wise during the winter months. I rejigged my makeup bag a few weeks ago (as well as bought a few new products here and there) and it is making me feel so much more refreshed and spring-like. I always tend to go for minimal makeup in the spring time and I love to keep things even fresher and simpler than a usually do when the warmer seasons come around. 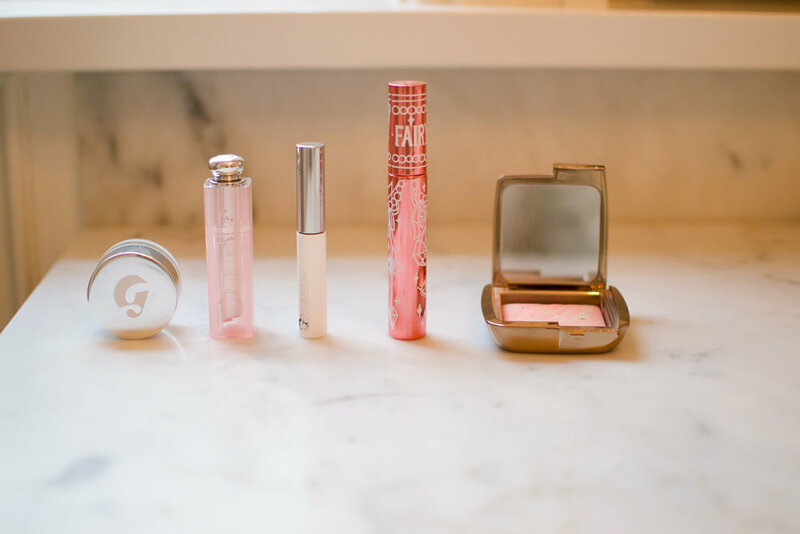 Because of that most of my makeup in the spring and summer is mainly eye and cheek products, since I usually just wear a swipe of tinted lip balm on my lips. One of my favorite additions to my makeup bag for spring has been the Make Beauty Bisou Bisou Universal Stick, which was created by Maddie from LaMadelynn. I love not only that you can use this product on both lips and cheeks (which can't always be said for most multi-purpose products), but the shade is unlike anything else I have in my makeup stash. It is the perfect bricky red tone, and when applied to my cheeks, makes me look like I've spent some time in the sun (without looking like a lobster). I also absolutely love the Glossier Haloscope in Quartz and even though it's a product I use year-round, it gets the most use during the springtime when I want that super healthy and glowy skin look. I'm normally into a good mix of matte and shimmer eyeshadows, but for some reason this spring I got very into shimmery eyeshadows that are so iridescent they almost give off that glossy eye look. As I'm sure most of you know, I love a good cream eyeshadow stick and the Laura Mercier Caviar Stick in Moonlight is my most recent edition in my eyeshadow stick collection. The color is a sandy bronze color, that leans a tad cool without being full on taupe. While it is incredibly shimmery it doesn't come off as tacky or frosty, but rather its metallic and because of that looks glossy when applied all over the eye lids. I think it would be remiss of me to give the Glossier Lidstars a mention. I have to say that I don't think these are the be all end all of liquid eyeshadows, but the shades Slip and Moon are really nice if you just want a sheer wash of color all over the lid, and they are pretty fool proof to apply.